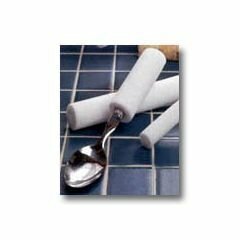 Product Overview Sammons Preston Foam for Built-Up Handles - 1/4" Bore, 3/4" Outside Diameter Foam for Built-Up Handles. Use to build up handles of eating and ADL equipment. White Plastozote foam comes one yard per package. Cold sanitization prolongs life. Latex free.